Apacer's ST170-300B (JEDEC MO-300B) is a well-balanced solid-state disk (SSD) drive with standard form factor and great performance. 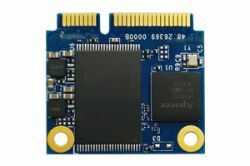 Designed in SATA 6.0 Gbps interface, the SSD is able to deliver exceptional read/write speed, making it the ideal companion for heavy-loading industrial or server operations. ST170-300B (JEDEC MO-300B) utilizes 3D NAND for higher capacity up to 240GB and provides more power efficiency than 2D NAND. It is suitable for Embedded, POS, KIOSK and IPC applications to optimize its operating conditions featuring in high-speed, stability and power savings.